Looking for hotels near SM City Davao? Located in Davao City, within a 6-minute walk of SM City Davao, One Oasis Davao Condominium offers accommodations with air conditioning. Located 656 feet from SM City Davao in Davao City, this apartment features a terrace. Guests benefit from free WiFi access, 24-hour security and private parking is available on site. Offering an outdoor swimming pool and pool view, Marlene's Condo at One Oasis Davao is located in Davao City, a 6-minute walk from SM City Davao and 1.8 miles from Matina Town Square. Marton Suites in Davao City provides accommodations with free WiFi, a 6-minute walk from SM City Davao. The property is 1.5 miles from Matina Town Square and 3.1 miles from People's Park. Complete with an outdoor swimming pool, Denise's Condo in Davao is located in Davao City, a 6-minute walk from SM City Davao and 1.9 miles from Matina Town Square. Set in Davao City, within 1640 feet of SM City Davao, Apartelle D' Oasis offers accommodations with free WiFi, air conditioning and an outdoor swimming pool. Marco Polo Davao offers spacious 5-star accommodations that overlooks Mount Apo or the Gulf of Davao. Everything was just perfect for me and my kids! TIL the next new year! The beautiful Bahay ni Tuding (House of Tuding) is located in downtown Davao. It provides cozy accommodations with private bathrooms and free WiFi access. Aside from being affordable, the property gives a feel of comfort! The Madeline Boutique Hotel & Suites has rooms in Davao City. Featuring a 24-hour front desk, this property also provides guests with a sun terrace. The hotel provides a Local restaurant. The property is very quite and clean comfortable. Set in Davao City, 0.9 mi from Abreeza Mall, ZEN Rooms Dona Vicenta has rooms with free WiFi access. 1.2 mi from People's Park, the property is also 2.2 mi away from Matina Town Square. The staffs are very accommodating. Their breakfast is way too good!! Just 3 blocks from Gaisano Mall, North Zen Basic Spaces is located in Davao City. Providing massage services and free parking, it offers a restaurant and rooms with flat-screen TVs. Place is near the mall. Staffs are friendly and accommodating. Lenma Family Inn is located in Davao City, an 8-minute walk from SM City Davao and 1.1 miles from Matina Town Square. All rooms have a flat-screen TV with cable channels and a private bathroom. Featuring an outdoor swimming pool, Condo To Go- back SM Mall is located in Davao City, an 8-minute walk from SM City Davao. Located a 14-minute walk from People's Park, ZEN Rooms Roxas Avenue has rooms with air conditioning in Davao City. This 2-star hotel offers a 24-hour front desk and free WiFi. Location was great, by the outdoor market. Many good places to eat. The service was great. Located in Davao City, a 15-minute walk from Abreeza Mall, ZEN Rooms Pryce Business Park provides air-conditioned rooms with free WiFi. Accessible. Excellent location. Hotels with great access to SM City Davao! Located in Davao City, this hotel is a 10-minute walk from People’s Park and the Aldevinco Shopping Center. Providing free Wi-Fi access and parking, it also houses 2 dining outlets and an outdoor... Cheapest hotel to stay in Davao, close to popular destination and malls. Providing free WiFi, Star Hotel is located in Davao City, within a 20-minute walk of People's Park. The property features a bar, as well as a restaurant serving Asian cuisine. Rooms are modern, we did not expect this for this low price. Located in downtown Davao City, My Hotel offers simply-furnished rooms with free Wi-Fi and cable TVs. Guests enjoy free parking privileges. A business center and restaurant are available. They offered choices for the breakfast which was good enough. Providing free WiFi, Blueberry Tourist Hotel is located in Davao City, within a 14-minute walk of People's Park. 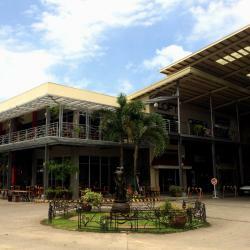 Offering a bar, the property is located within 1.2 miles of Abreeza Mall. Clean rooms, decent simple breakfast. Good tv channel selection. Kinda far from the center of Davao City but still very accessible via public transport, either via jeepney or taxi. Not sure if this is the widest mall in Davao City but they got almost everything, from grocery to department stores. People are talking about SM City Davao! Explore guest hotel reviews featuring "SM City Davao"
great location with only walking distance to sm city davao, value for money, friendly and safe neighborhood. the caretaker, beth, facilitated ordering water for us, so thats a plus. great for kids, we travelled with our 2-year old son, there is a playground and pool for kids recreation. The location was pretty convenient since it was really close to SM City Davao. Aside from that, there were other establishments nearby such as a coffee store, convenience store and a laundry shop. Property just a walking to SM City Davao. Livable place esp when you have infants or children. Love the place. Safe and quiet.